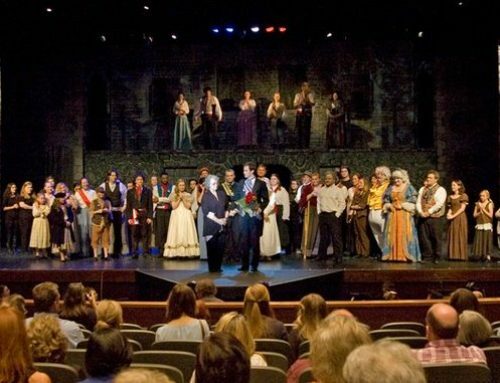 The South Arkansas Arts Center begins its fifty-first theatrical season with their very first staging of William Shakespeare’s “Twelfth Night.” The 414 year-old comedy of gender confusion and love will be presented February 27 through March 8. The production is sponsored by Teague Auto Group and Southern Bancorp. Shakespeare’s play “Twelfth Night, or What You Will” was written to be performed as a Twelfth Night entertainment. Twelfth Night is a festival, in some branches of Christianity, marking the coming of the Epiphany and concluding the Twelve Days of Christmas. It is defined by the Shorter Oxford English Dictionary as “the evening of the fifth of January, preceding Twelfth Day, the eve of the Epiphany, formerly the last day of the Christmas festivities and observed as a time of merrymaking”. In medieval and Tudor England, the Twelfth Night marked the end of a winter festival that started on All Hallows Eve — now more commonly known as Halloween. The actual Elizabethan festival of Twelfth Night would involve the antics of a Lord of Misrule, who before leaving his temporary position of authority, would call for entertainment, songs and mummery (folk plays). The Lord of Misrule symbolizes the world turning upside down. The earliest known performance of Shakespeare’s “Twelfth Night” took place at Middle Temple Hall, one of the Inns of Court, on Candlemas night, 2 February 1602. The play has many elements that are reversed, in the tradition of Twelfth Night, such as a woman Viola dressing as a man, and a servant Malvolio imagining that he can become a nobleman. The play centers on the twins Viola and Sebastian, who are separated in a shipwreck. The plot focuses on the Countess Olivia falling in love with Viola (who is disguised as a boy), and Sebastian in turn falling in love with Olivia. The play expanded on the musical interludes and riotous disorder expected of the occasion. The play has been regarded as preserving this festive and traditional atmosphere of licensed disorder. Servants often dressed up as their masters, men as women and so forth. This history of festive ritual and Carnivalesque reversal, characterized by drunken revelry and inversion of the social order; masters became slaves for a day, and vice versa, is the cultural origin of the play’s gender confusion-driven plot. Haley Nix Phillips has been selected to direct the first staging of the comedy on the SAAC stage. Auditions are scheduled for January 12 and 13.